A natural, classic look prevails with the Turbo II. Ramp up your game to the highest level of exhilaration. Great shoe for comfort and performance. Very comfortable and classy looking! Couldn't be happier. Now if these shoes could automatically increase my average without lots of practice, that would be perfect! considering that shoe rental can cost up to 2~ 4dollars per visit. and it slide much much better than those rental shoes one get. These shoes are great. I've been a bowler for 30 yrs+. I've had Linds customs years ago, now I have these Dexters and they are as good as my Linds. By heavy hitter from Swansea M.A. i am league bowler and i love these shoes good if you like to slide. and are very comfortable a good product. The Dexter Turbo II Bowling shoes are very comfortable, and my feet are really particular about shoes these days. This shoe feels good enough to wear for everyday although it is a bowling shoe. I noted they are true to size, but I had to get a size larger because my feet have some sort of medical condition going on right now which makes them swollen. I am pleased with my purchase. I am a casual bowler after years of not bowling at all, and sometime soon I hope to maybe get back into league bowling. Great shoe for the money!!!! Best pair of shoes I have had in over 25 years. Great shoe overall, very comfortable. Dexter makes the most comfortable wide width bowling shoes that I have worn. These were an upgrade from my previous pair of Dexter shoes. The only complaint I have is that there needs to be a loop for the laces to go through higher up on the tongue to keep it from slipping down. Or the tongue needs to be longer and a little fatter at the top. Just getting into bowling, so I wanted my own gear. Seem to be great entry level shoes at a great price. This shoe will be EE. The widest shoe we have will be the Linds and they are EEE. Hello! This shoe actually have universal soles, so there will be a slide sole on both shoes. Hi. This is a man made upper meaning it is a synthetic leather. Women's shoes do not offer wide. Would standard mens' width shoe work for woman? Hello Myrtle! Yes, a regular width in men's shoes will be the same as the wide width in women's. The wide width in men's will be an extra wide in women's. You will also need to go down 2 sizes. If you wear a women's 9, you will need a men's 7.
what does ''True fit guarante mean? Hello! The True Fit Guarantee is a one time fee of $5.99, we will send a pre-paid shipping label with your shoes. If your shoes do not fit and you need to exchange them for a smaller or larger size, you can use the shipping label to ship them back to us. The True Fit Guarantee will also cover our $5 reship fee that we normally have for shoe exchanges as well. Unfortunately these are fixed universal soles and cannot be replaced. Unfortunately, these have fixed universal soles that cannot be changed out. Is this shoe for a right handed bowler? I’m looking at these for my son but I’m not aware of him having a wide foot...Just your average foot. Will this still work for him? We would advise you not to purchase a wide width shoe unless that is the typical width shoes you usually purchase. Hello! The only triple E width that we offer is the Linds Mens Classic Black Wide Width. How do these compare to the Ricky IV? These will be a more traditional type of bowling shoe whereas the Ricky IV's will be more a sneaker type of bowling shoe. How slick are these? Do they easily slide or do they just slide a little? These will slide very easily. My skechers size, in a wide is 10 1/2. my old dexter sneeker style from 2005 is an 11. The soles glue to the shoe has failed. they are in great shape otherwize. If i change to a turbo II what size do I order? does this shoe run small? For the most part this shoe runs true to size. With any shoe we will have some returns that it runs too small and some that it runs too big. If you are concerned about the fit, we suggest getting the True Fit Guarantee option which can help make the exchange process quicker and easier. Yes, that is correct! 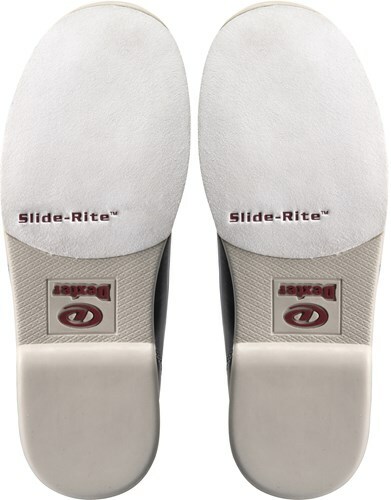 This shoe will have slide pads on both soles, for this is a universal sliding sole shoe. I wear an 8 Extra Wide (EEE), I don't see this option? The Mens wide shoes will be a EE width. 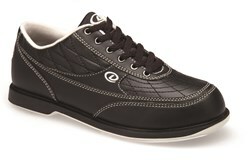 The only pair of shoes that we carry in a EEE will be the Linds Mens Classic Black Right Hand Wide Width. Due to the time it takes to produce the Dexter Mens Turbo II Black Wide Width ball it will ship in immediately. We cannot ship this ball outside the United States.